The Copenhagen Conservation School intermittently asks Tim to give a course in how to set up scientific experiments. It is mainly an exercise in searching institutional attics for materials and discarded apparatus, then descending into the active rooms and borrowing instruments from the generous staff. For this course we have also had much help from two fairly recent developments. One is the Arduino microcomputer for measuring sensor signals very cheaply; the other, more local, innovation is the FabLab (fabrication laboratory) at Roskilde University (fablab.ruc.dk), which has been an invaluable source of components and advice. 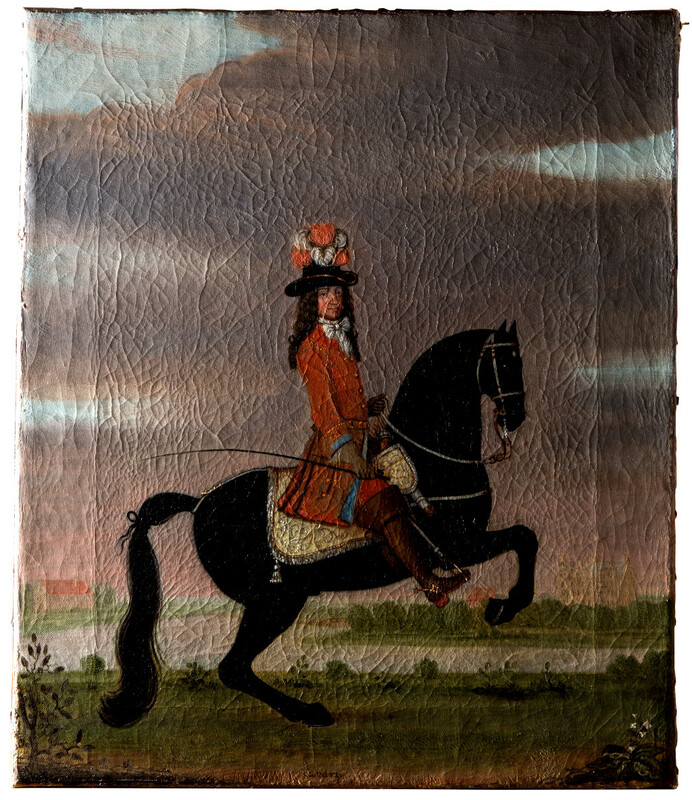 An anonymous painting from around 1690, illuminated by raking light to show the protective effect of the wooden frame behind the canvas. 390 x 460 mm. From the Rosenborg Palace collection, Copenhagen, photo by Berit Møller. There are many examples of old oil paintings with craquelure which are noticeably better preserved where the wood of the stretcher is just behind the canvas. An article by Di Pietro and Ligterink (Frank J. Ligterink and Giovanna Di Pietro. 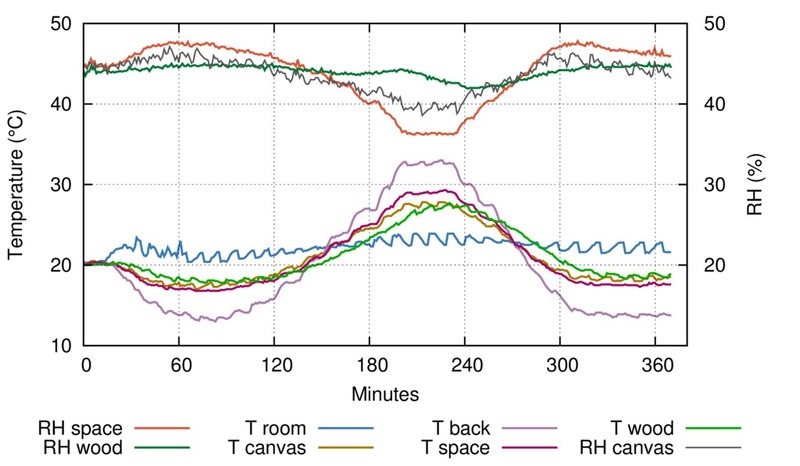 'Canvas paintings on cold walls : relative humidity differences near the stretcher'. In Museum Microclimates, T. Padfield & K. Borchersen (eds.) National Museum of Denmark 2007	ISBN 978-87-7602-080-4) seeks to explain the phenomenon as primarily caused by temperature fluctuation, which is moderated by the stretcher. Their experiment did not impose a daily temperature cycle, which has surely been the normal experience for oil paintings before the twentieth century. We have gone a step further, imposing an even faster and more extreme temperature cycle, in an attempt to provoke reactions which can hint at what happens in a gentler environment. A double coil of silicone tubing was fastened to the floor of a shallow steel pan. It was held in place by a pad of ethafoam. The cold "wall" was made from a galvanised steel shallow pan, labelled for use in preparing plaster for marbling baroque interiors but found languishing in the attic of the school's painting department. 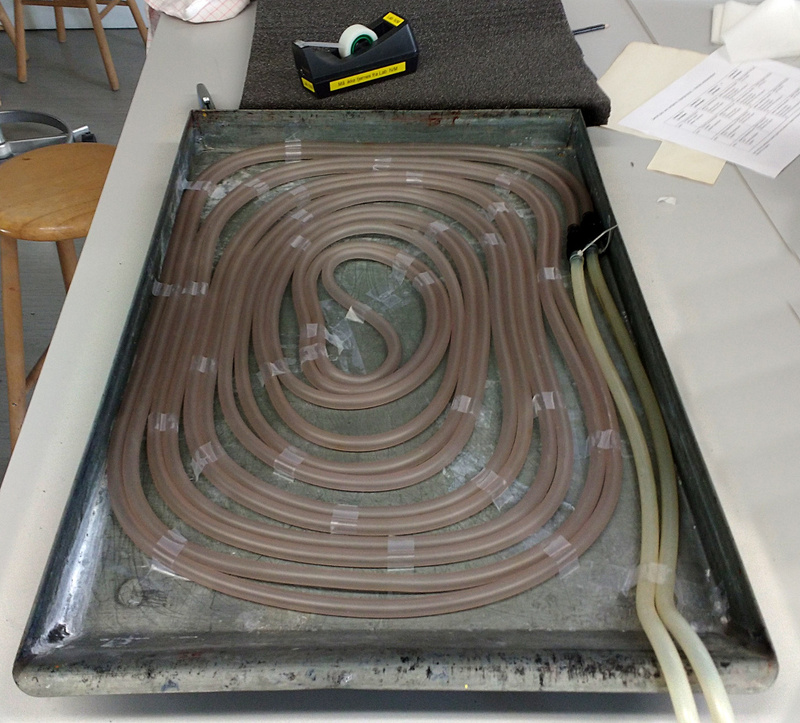 A drawer in the chemistry lab contained an exactly suitable length of silicone tubing. This was arranged as a closely packed double spiral which was squeezed against the pan base by an ethafoam pad, also liberated from the attic. The source of water to circulate through the tubing was a device used to control the temperature of an electrophoresis analytical machine. It was state of the art in 1998 but had no automation or remote connection, so one of us had to sit by the push button temperature controller to step the temperature every ten minutes. We continued the fine tradition of blank canvas experimental art. One of the neglected variables in painting research is the considerable temperature variation in the picture plane caused by light falling on different colours in the image. This plain white canvas with acrylic ground provides the base data for further experiments exploring the microclimate variation produced by dark areas under illumination, particularly by sunlight. The picture frame was constructed with a cross beam. This beam was mounted on diagonal sliders so the distance between the canvas and the wood could be varied. For this experiment the gap was about 4 mm. 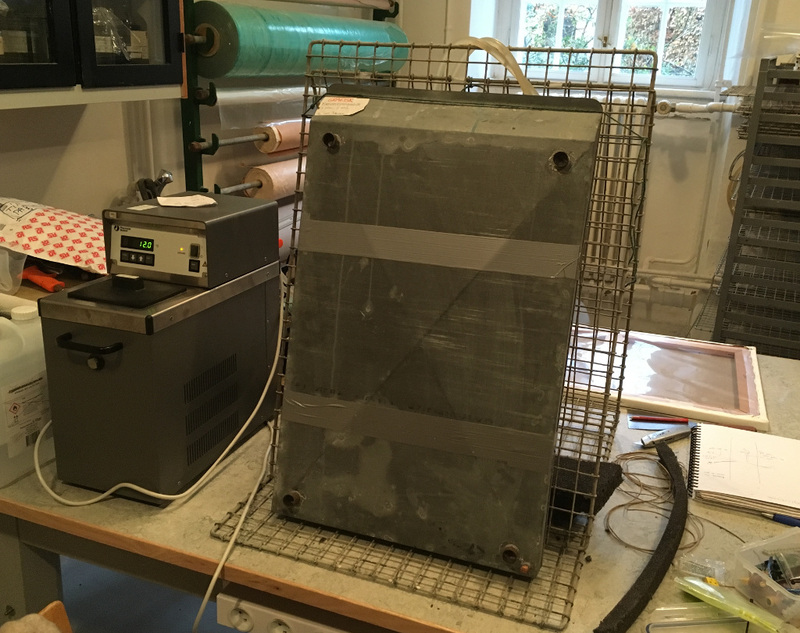 The picture frame was made nearly airtight (about 0.3 air changes per hour, according to carbon dioxide escape measurements) by melinex polyester foil stretched over the back. The RH was measured in the enclosed space and also in a shallow groove cut into the cross beam. Temperatures were measured at the RH sensors and at the surfaces of the canvas and the polyester. The picture was leaned against the nearly vertical wall. The cross bar with attached instruments and data gathering. This group photo shows the RH and temperature sensors set in a shallow recess in the cross bar, to measure the microclimate between bar and canvas, which was a 4 mm deep space in this experiment. The bar also holds flying sensors to measure the RH and temperature in the void between canvas and back plate and also thermocouples in springy type K metal which pressed against the canvas and the back plate respectively. Also in the picture are thermocouples for measuring the wall temperature and the ambient room temperature. The arduino measuring module is also shown, though it was placed remote from the final assembly. The sensor data was collected every minute by an Arduino uno with a thermocouple (type K) multiplexer shield (Ocean Controls KTA-259K) and direct analog input of the RH signal (Honeywell HIH 4000). The data was logged to a usb memory stick mounted on a Raspberry pi microcomputer. The sensors in place, seen looking towards the back of the canvas. The cross beam slides on diagonal runners in black hardwood, which allows fine adjustment of the distance between wood and canvas. The flying thermocouples are clearly visible and touch the canvas and the back covering of polyester film, here show peeled back. The assembled experiment. The sides of the assembly are insulated to minimise edge effects on the interior microclimate. The canvas dimensions are 600 x 500 mm. 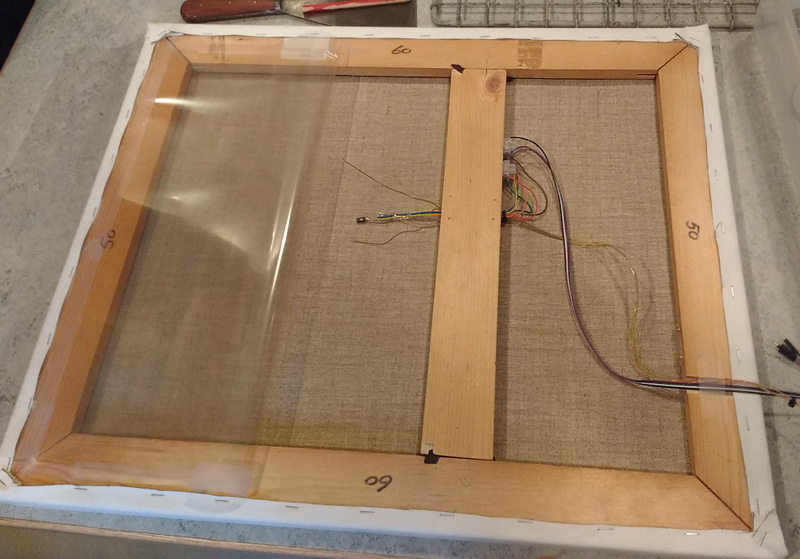 The placing of sensors within the picture enclosure, and outside. Experiment 1. The microclimate within the picture frame with an airtight but non-insulating back plate. The RH at the canvas is calculated from the dewpoint measured at the RH sensor within the space and the temperature at the canvas surface. The calculation assumes that the canvas is not reactive to moisture. Experiment 2. The microclimate within the picture frame with an airtight but non-insulating back plate and with 10 mm foam insulation placed behind the canvas in the same plane as the wooden cross beam. Experiment 3. The microclimate within the picture frame with an airtight but non-insulating back plate and with 4 mm card buffer placed just in front of the back plate. Experiment 3 plus theory. The microclimate within the picture frame with the buffered back with superimposed theoretical curves for the RH at the canvas on the assumption that the space is entirely unreactive to humidity and on the assumption that the buffer at the back plate has unlimited capacity and infinitely quick reaction. The actual performance indicates a moderate buffer performance by the combination of the buffer at the back and the buffering by the canvas. The rapid and extreme temperature cycle imposed by the 'wall' shows up trends that also apply in gentler cycles but are then scarcely noticeable. In the first experiment there was no thermal insulation except that provided by the wooden cross bar. The temperature in the space between the canvas and the back protection lies roughly mid way between the room and the wall temperatures. 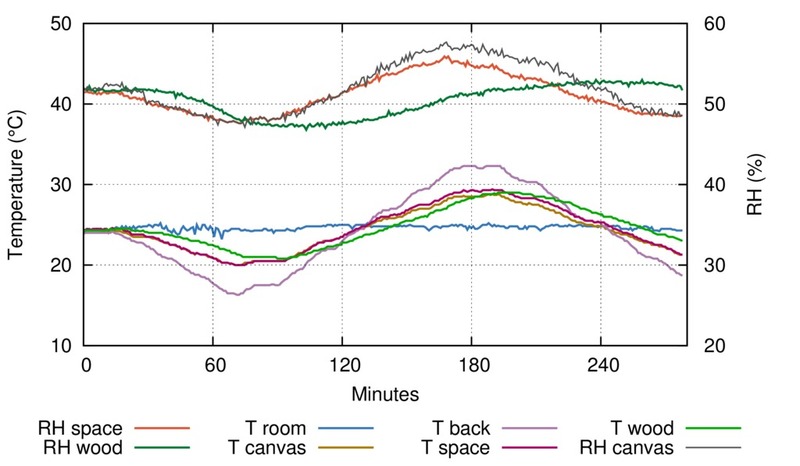 The canvas temperature is close to the space temperature except when the wall temperature peaks, at which time it falls a little towards the room temperature. The canvas is evidently strongly influenced by the wall temperature. 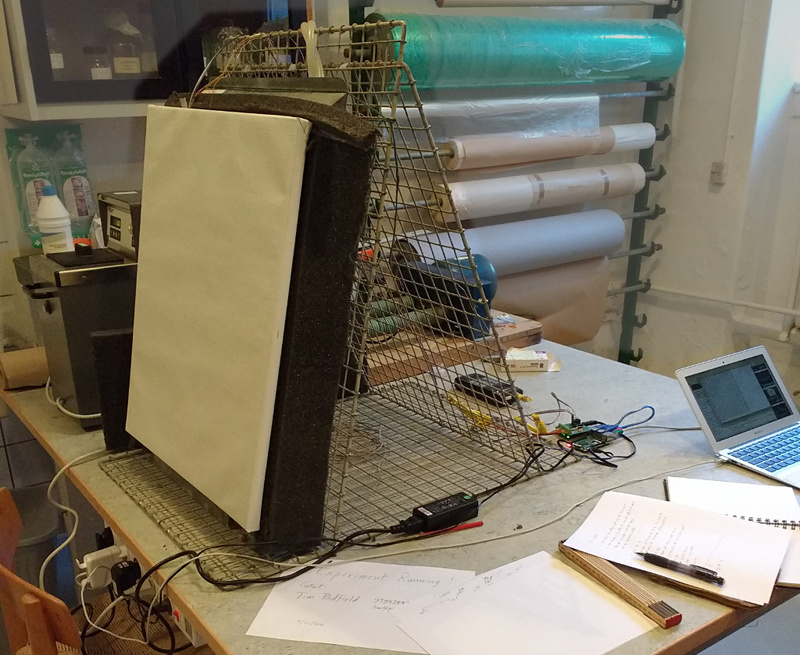 In the second experiment with insulation behind the canvas, the influence of the wall temperature is clear, but reduced to about a quarter of the temperature span between wall and room. The temperature between the wooden beam and the canvas lags behind the temperature change in the open space between the canvas and the polyester film stretched across the back of the frame, because of the heat capacity of the wood. This temperature also has a smaller variation in the first experiment, because of the thermal resistance of the wood. In the second experiment, the wood has a smaller thermal resistance than the insulation, so its temperature variation is greater than that in the space behind the canvas. Because of the greater heat capacity of the wood compared with the insulation foam, its temperature lags behind the space temperature. In the sealed space, experiment 1, the RH measured in the narrow space between the wooden beam and the canvas is notably stable throughout the temperature cycle. 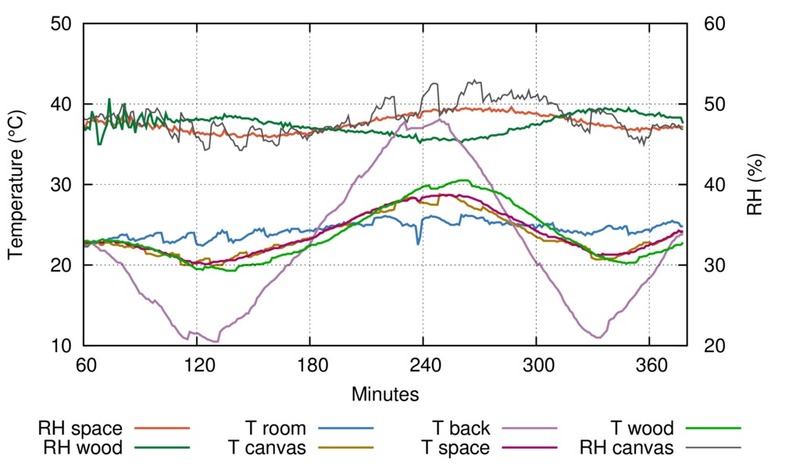 The RH calculated for the canvas surface varies inversely as the temperature but not as much as expected for an empty space, indicating some buffering from both the canvas and the wooden frame. 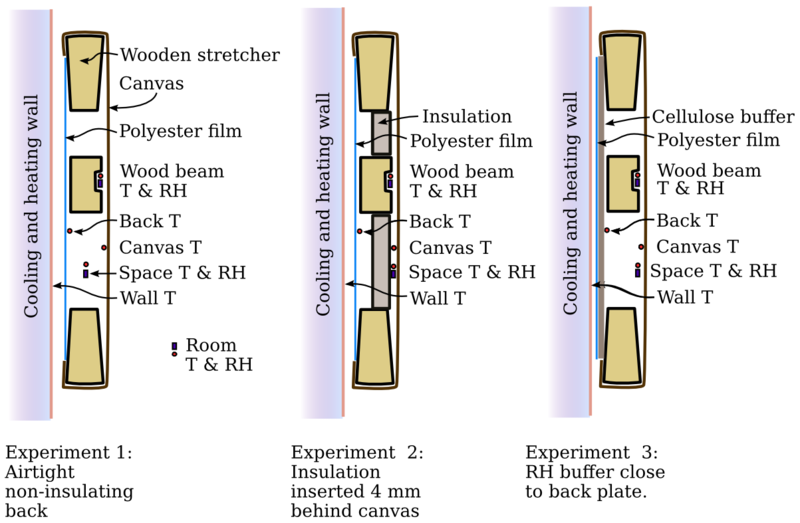 In experiment 2, with insulation, the RH in the free space is much more stable and is in the opposite direction to the unbuffered curve, indicating much stronger buffering by both the canvas and the paper cladding of the foam panel in this much shallower space. The wood RH however, is strange, since it now varies in step with the unbuffered curve. This odd behaviour is perhaps explainable by sideways movement of water vapour from the wood to the space behind the canvas. In the third experiment, the cellulosic back plate buffers its immediate air space at the temperature of the back plate. When this air convects to the canvas surface at a different temperature its RH changes considerably, evidently destabilising the canvas, which shows a 10 percent point RH cycle. One can see that an effective RH buffer set at a distance in temperature from the painting has a destabilising effect on the moisture equilibrium of the canvas. More elaborate speculation and calculation would be pointless, given the many imperfections in the experimental setup. The first experiment was conducted in an unused basement room, with a stable RH but a temperature cycle caused by the operation of radiator thermostats. Foolishly, we complained about this variation and were rewarded with a place in a climate-controlled room, filled with delicate and costly apparatus of elegant perfection compared to our rough construction. However, from the instant of switching on our water cooler, rated at 1.2 kW, plus 0.1 kW from the human attendant, the ambient RH went into a wild excursion with a span of 20% over an exact hourly cycle. No free water was involved in the experiment, apart from the operator's breath, so it seemed a rather hysterical reaction from the air conditioning. The regularity of the cycle is strange and suggests some fundamental instability in the control mechanism. The temperature also lost its calm and chugged upwards with a 20 minute cycle time. 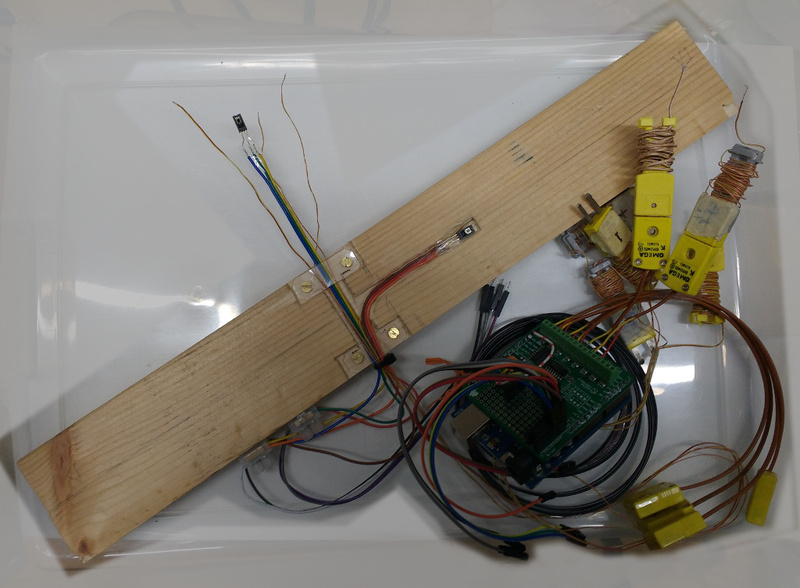 We had strange intermittent errors from the multiplexer sending temperature signals to the arduino, which were mitigated in the third experiment by setting a long settling delay between measurements. The effect of the wooden cross bar is to reduce both RH and temperature fluctuations in the space between it and the canvas. This is hardly surprising, but may help simplify the abundance of opinion, advice, assertion and practice about how to protect an oil painting from its immediate environment. Wood is not an ideal material to place in a nearly airtight enclosure because it outgases acidic vapours. The same calming effect would be provided by lightweight insulation close behind, but not touching the canvas, perhaps with a sheet of paper between to simulate the RH buffering effect of the wood. Such an arrangement could easily be tested, but it would be good first to make a better, and more energy efficient, temperature-controlled plate and put it in a room with a more stable climate. This project could only have been realised (almost) within the three week period of the course in scientific research methods with the help and loan of materials and equipment from the Copenhagen Conservation School, the conservation department of the National Museum and FabLab in Roskilde University.